I’ve recently returned from a research visit to the USA where it was a great pleasure to meet up with CTC and TCC graduates. 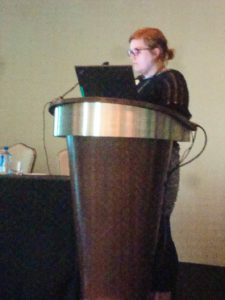 I attended the American Institute for Conservation (AIC) conference in Houston and then went on to Washington, DC, to meet my Co-Investigator, Adrienne Kaeppler, Curator of Oceania at the National Museum of Natural History, to discuss future plans for our research project, Situating Pacific Barkcloth in Time and Place. We were also fortunate to visit the stores and the conservation lab of the Textile Museum, based outside the city, where TCC graduate Maria Fusco is the Chief Conservator. My stay in Washington coincided with a visit by the University of Glasgow’s Principal, Professor Sir Anton Muscatelli, who was in the city to sign a memorandum of agreement between the University and The Smithsonian Institute. 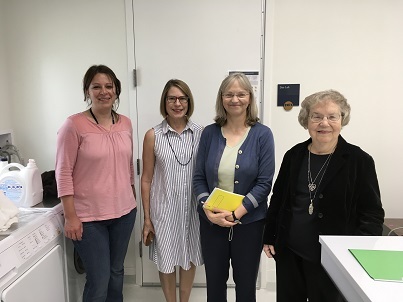 In the Textile Museum conservation lab: (left to right) Maria Fusco, Patricia Ewer, Frances Lennard and Adrienne Kaeppler. Photo by Michele Austin-Dennehy. At the AIC meeting CTC graduates and I formed a very small subset of four within the conference reception for UK-trained graduates, but the small size of our group didn’t diminish the pleasure of catching up on all the news! 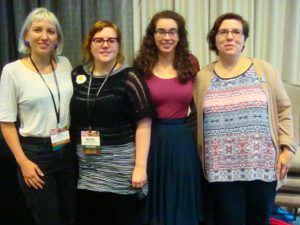 Recent graduates, Nora Frankel and Michelle Hunter both gave papers in the Textile Working Group session. 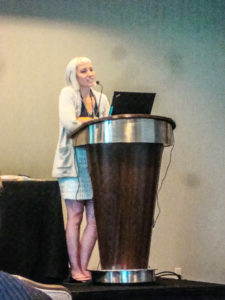 Nora spoke about a research project on the identification of ‘Indian hemp’ plant fibres she has been carrying out during her Mellon Fellowship at the National Museum of the American Indian (NMAI), part of The Smithsonian Institution in Washington, DC; her co-authors were Susan Heald and Dr Thomas Lam. 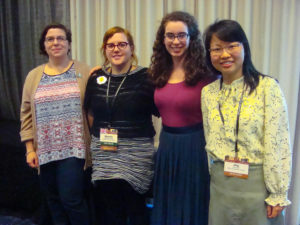 Michelle presented her MPhil dissertation project, an investigation into the fading rate of the early synthetic aniline dye, magenta, in a paper co-authored with her dissertation supervisor, Dr Anita Quye. I also gave a paper on our research project From the Golden Age to the Digital Age: Modelling and Monitoring Historic Tapestries. Glasgow graduates: (left to right) Gennifer Majors, Michelle Hunter, Beth Knight and Jing Han. Glasgow graduates: (left to right) Nora Frankel, Michelle Hunter, Beth Knight and Gennifer Majors. The conference theme, Material Matters, was reflected in a range of contemporary topics in the general sessions, from the conservation of contemporary art and of 3D printed objects to an argument for the accessioning into collections of the material culture of conservation itself. The Textiles Working Group sessions also focused on this theme. I particularly enjoyed a presentation on the analysis of methods for cleaning a large painted muslin at the NMAI by Susan Heald and her colleagues, given in a joint session with the Research and Technical Studies Group (RATS). Presentations on the conservation of a Mortlake tapestry at the Metropolitan Museum of Art, New York (Alexandra Barlow and Olha Yarema Wynar), research into the 1960s-70s conservation of a set of battle flags (Ann Frisina) and an in-depth investigation into the condition and conservation of 18th century gowns at the Costume Institute, New York (Marina Hays) were also highlights for me. 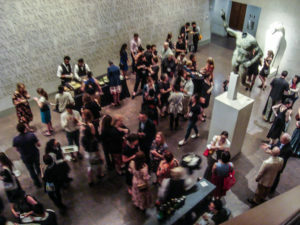 The conference delegates were treated to wonderful Texan hospitality – we were extremely privileged to attend a reception in the impressive surroundings of the Houston Museum of Fine Arts where we had the opportunity to catch up with old friends and meet new colleagues. It was also great to meet textile conservation colleagues and members of the RATS Group at an evening reception. Delegates at the informal session: A Failure Shared is not a Failure. One of the most interesting parts of the conference was the closing session where, in a much less formal environment, delegates were invited to reflect on their past mistakes, with the overall aim of helping us all to learn from them. I felt this really demonstrated the maturity and self-reflectiveness of the conservation profession and told us a great deal about the characteristics we share. There were serious moments of reflection, where we were warned not to take too much responsibility upon ourselves, but also lighter moments which showed conservators’ skills and ingenuity when faced with unexpected events. It was certainly food for thought, and fulfilled the expectation that we’d all be able to learn from hearing about others’ problems. The participants were invited to introduce themselves with fun facts, which certainly added to the entertainment value of the session! 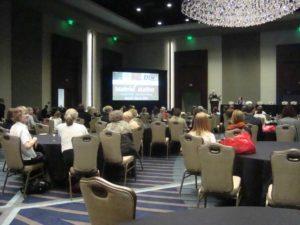 I enjoyed the conference very much but was not sorry to swap the hot and steamy weather in Houston (99˚F and 77% humidity contrasted with Arctic air conditioning indoors) for the balmy weather in Washington, DC. The Principal’s visit to the city was in recognition of the wealth of collaborative partnerships which exist between the University and The Smithsonian: these include our own barkcloth project and other long-standing collaborations in the areas of provenance research and research into the two institutions’ outstanding collections of the artist James McNeill Whistler. The Principal took part in a photo call to mark the occasion, which took place in the Whistler-decorated Peacock Room housed in the Freer Gallery of Art. He was particularly pleased to meet two History of Art students on the Masters programme in Collecting and Provenance Studies who are undertaking internships at The Smithsonian, and our own MPhil Textile Conservation graduate Beth Knight, who is also a Mellon Fellow at NMAI. 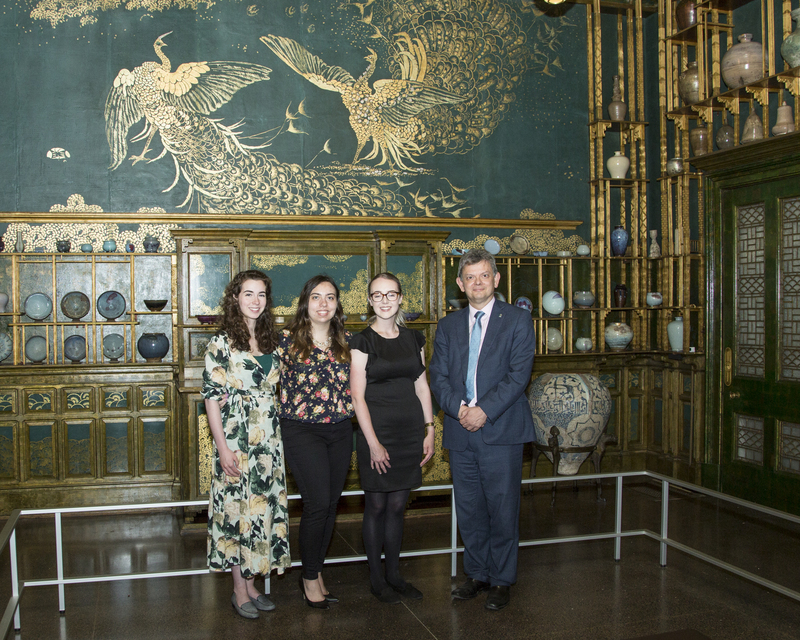 The University of Glasgow’s Principal, Professor Sir Anton Muscatelli, with Beth Knight (left) and students from the Collecting and Provenance Studies programme, in the Peacock Room of the Freer Gallery. Photo by Michael Barnes, The Smithsonian. With many thanks to all the organisers at AIC and the Textile Specialty Group, and to all our colleagues in Washington, DC for a great trip.